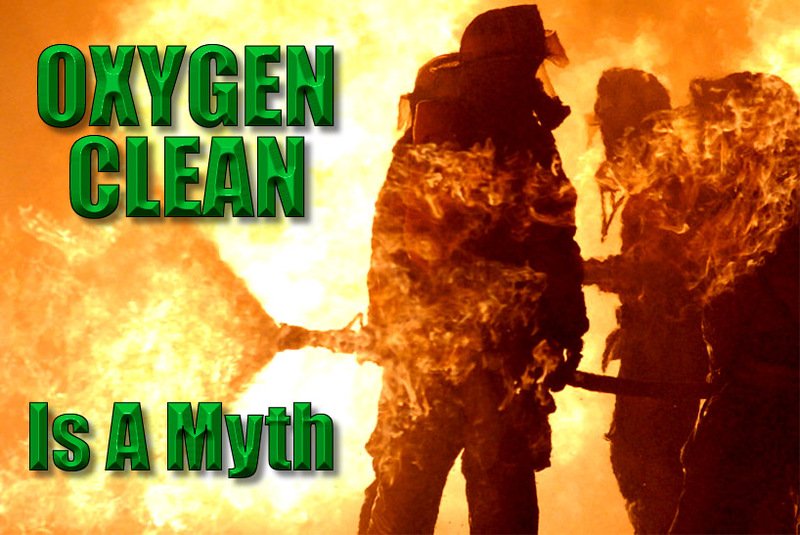 The term "oxygen clean" is a myth. There is no such beast as "oxygen clean" in the recreational dive industry. For one to think so is just plain dangerous. Oxygen clean is the verifiable absence of particulate, fiber, oil, grease and other contaminants. Verifiable absence is determined through the use of qualitative and quantitative cleanliness measurement techniques. 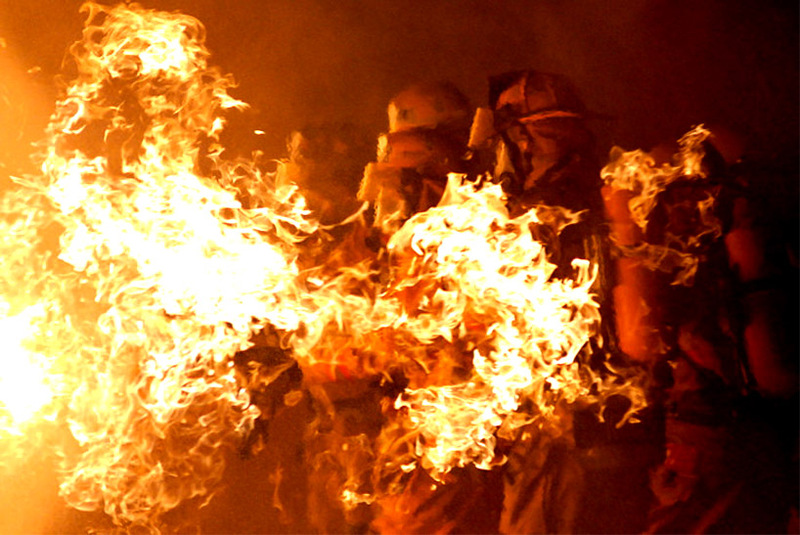 Oxygen itself does not burn, but it does enhance combustion. All experts agree that in a high-pressure system containing elevated concentrations of oxygen, a standard of cleanliness called "oxygen clean" is required. Why then is it not possible to have something "oxygen clean" in recreational diving? Ironically, it is not difficult to attain a verifiable oxygen clean state using readily available cleaners and quantifiable tests. There are many sources of information on how to do this correctly. In a perfect world there can be no question that cleaner is better. The difficulty lies in recognizing that "oxygen clean" is static, a "state of being" at one point in time. Once a dive shop puts an oxygen-cleaned part into service, it quickly degrades to a level where it would no longer pass the tests for oxygen clean. It is just not possible to maintain an oxygen clean condition in equipment that is being used. Keep in mind that the oxygen content in air supports combustion, so if the air is enriched with even more oxygen, does the pressure system holding the gas mixture need to be squeaky clean? Scientists have shown that contamination (especially hydrocarbons) could produce the kindling chain required to turn an ignition source into a metal melting deflagration. For this to happen, however, it must be compounded by additional factors such as an elevated oxygen content or higher pressures and temperatures. Conversely, consider that it is quite possible to flow pure oxygen through horribly contaminated equipment, without incident, if the pressure and temperature are low and there is no ignition source. As an example, the medical patient requiring oxygen is, by definition, not oxygen clean, nor is the oxygen administration set that is being used. But, the high-pressure oxygen regulator, which is "oxygen serviced", delivers the gas at a low pressure and temperature, thus minimizing/eliminating the chance of unwanted combustion, even though the gas is nearly pure oxygen. However, should the patient light a cigarette, this source of ignition could spark a very undesired outcome. How does all of this relate to SCUBA? Although every oxygen-serviced part is susceptible to contamination, consider what happens to a nitrox SCUBA cylinder in use. A recreational diving facility "oxygen services" a diver's cylinder and valve, cleaning to a verifiable standard, then replacing all of the non-oxygen compatible parts and lubrication. If this cylinder and valve was then hermetically sealed in an oxygen-serviced container and never used, it would remain suitable for oxygen service indefinitely. Realistically, this is not what happens. After "oxygen servicing" the cylinder, the technician puts an "oxygen serviced" decal on the cylinder. This decal is often part of the annual "visual inspection" decal, inferring that the cylinder and valve are oxygen serviced for one year. The cylinder is then put into service. The recreational diver, who doesn't necessarily understand the "oxygen serviced" distinction and concomitant responsibilities, has the cylinder filled wherever convenient, not understanding that even one fill with regular compressed air could have enough condensed hydrocarbons to render the cylinder unsuitable for oxygen service. It is important to realize that sooner or later, every oxygen-serviced SCUBA cylinder becomes contaminated. The problem is that divers just don't know when the contamination threshold has been crossed. If an unsuspecting gas blender takes the oxygen serviced label at face value, partial pressure blends a nitrox mix in the cylinder, then that blender is at risk. As Elliot Forsyth, from Wendell Hull and Associates (the NASA oxygen engineers), put it: "Consider that the common "Bic" lighter has every requirement for a flame, but it doesn't necessarily light every time". The same holds true for partial pressure blending oxygen-enriched air in a SCUBA cylinder. It's just a matter of time before an unwanted ignition incident occurs. This single fact is the reason why it is unacceptable to partial pressure blend directly into SCUBA cylinders for general EANX mixes to 40 percent. Dive shops that partial pressure blend in quantity; utilize a closed system that must be continuously monitored for contamination. These shops mix into oxygen serviced cascade cylinders. Because the final mix in the cascade cylinders has an oxygen content of 40 percent or below, a diver's SCUBA cylinder is not required to be oxygen serviced. For deco mixes above 40 percent there is simply no choice. These mixes are always blended into oxygen-serviced cylinders. Hopefully, divers and blenders operating at the level where deco mixes are commonly used, frequently O2 clean their deco cylinders and take every precaution to insure that all equipment remains in oxygen service. Just how much contamination constitutes a problem? Technically, all it takes is a bit of dust or a misplaced fingerprint on the valve face to contaminate an oxygen cleaned part. Consider that a diving regulator that was last used on a valve with a normally lubricated "O" ring could easily cross contaminate the valve on an oxygen-serviced cylinder. In short, it takes very little contamination to fail the oxygen clean tests. We must understand that oxygen clean is important, but it plays only a partial role in the big picture. The fraction of oxygen, maximum pressure, gas velocity, temperature, material compatibility, equipment design, contamination and ignition sources are all inter linked. If the fraction of oxygen is high, insure that proper equipment design is utilized, the oxygen service is current, keep pressures and temperatures low and open valves slowly. The bottom line is that those who hide underneath the oxygen-clean umbrella are perhaps not as protected as they believe. The fact that you oxygen cleaned is good, but you just don't know when the threshold of contamination has been crossed. The concept of hoping that a piece of equipment is still "clean enough" is pure folly. If you approach gas blending from the position of controlling the variables that you can, such as system design, oxygen service, gas velocity, air purity, pressure and temperature, then the outcome will be based on science, not guess work.